The media is in love with Barack Obama and so am I! So much so that I’m planning to buy eight place settings of the Barack Obama china to use every day. I’ll use the mugs every morning for coffee so that I can cherish every day the fact that we have a president now who stands for common sense. It’s going to be a little tough using the plates because I’m guessing they’re not dishwater safe, but what the hell? I can wash a few dishes in honor of our new president. 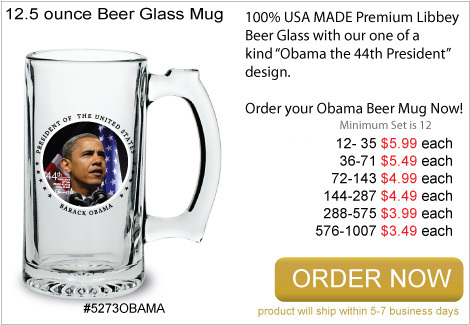 The Obama beer mugs I’m note sure about. I’m a wine drinker, but I can sip my Chardonnay out of a beer mug for Barack. And at only $3.49 each, I can order enough to last me a week without doing dishes. Oh? I’m sorry. These are commemorative objects, not to be actually used? You hang them on walls? That last bit was funny.